Driving home the other night, I got on the freeway and saw a single headlight coming up behind me. Initially I thought it was a motorcycle, but soon realized that it was a car with a missing headlight. It actually gave me a scare initially, because I wasn’t expecting a car. I quickly shrugged it off because it’s not that uncommon in a major city like Houston to see cars with missing parts, from front ends to bumpers, so a headlight wasn’t that unusual. However, when I got closer to my house, I saw two more cars with only one headlight, literally back to back. Now THAT was unusual! I saw THREE cars with just one headlight on my drive home. As I pondered this event, I realized that God was speaking to me! I asked the Lord, “God, what are you trying to tell me?” I didn’t get an immediate response, but the “three headlights” encounter simply wouldn’t leave me. I have been meditating on this for days, feeling the weightiness of this prophetic sign, praying and waiting for clarification from the Lord. During worship recently I was taken into an encounter. The Lord said, “Come up here.” As I focused on the light I saw with my eyes closed, it got brighter and brighter, and I saw the headlight of a car – a single headlight that was round and bright. The funny thing is that the headlight of the car I saw turned into the moon as I focused on it. Next, I saw Jesus’ hands, and I realized He was holding the moon. I saw Jesus seated, sitting cross-legged on the ground with the moon in His two hands. His face was lit up by the reflection of it, and He was beautiful! It occurred to me that Israel’s calendar is set to the moon, and the moon is in Jesus’ hands! I also heard “head-lights”, like a bulb came on in my head, as two separate words. I hadn’t thought of them in that manner before, just as car parts – headlights, not Head-Lights! God was speaking about lights in my head, ie, “the light bulb coming on”! What I really think is that He wants us to get it through our heads that He is the Light! I felt in my spirit that we should really focus on Jesus, that He is the singular purpose for which God created us! I also felt strongly in my spirit that the Lord was saying for us to really FOCUS on Him and on our purpose – to have laser sharp, FOCUSED SINGULAR VISION — that we are created for something SPECIFIC, for a special, singular PURPOSE. A lot of us have been running around with a “shot-gun mentality” – if we do enough stuff, we’re bound to hit something! I believe that God wants us to stop and focus on what He is saying, find our purpose and seek it for all we are worth, with everything we have! It also came to me during the encounter that the number three is significant, as is the number one. One stands for God, and three is the Trinity, us conforming to the image of Christ. As I soaked in the Lord’s presence, He began to show me that the number three and the number one all work together…Father, Son and Holy Spirit – all in one God! He went on to give me multiple examples – one sun, one moon, one earth, yet all three work in tandem. He mentioned there are many stars, and many galaxies, but only one planet with life. He also talked to me about the Tallit…there was a man in front of me wearing a tallit, and as I watched him put it over his head for his prayer closet, I wished in my heart that I had one. Just as my head tilted forward to pray, I heard the Lord say, “You have one,” as my hair fell around my face, forming my own personal tallit! The Word says that a woman’s hair is her glory (1 Cor. 11:15)! I got the full revelation of that today – the light came on for me, giving me full clarity of this verse. Lastly, speaking of His Light, His marvelous Light…I believe that God is talking to us, saying He is our light! The Lord showed me the vision of Jesus’ face reflecting the light of the moon, His prize Israel, shining brightly in His hands. I felt the Spirit say that just as the moon reflects the light of the sun, Jesus reflects the light of the Father, and we reflect the light of Jesus – as He holds us in His hands! Three combined into One — Singularity. So the more unusual you are, the more peculiar you are, the more one of a kind, strange, unique, remarkable or unusual you are…the more you are His prize and the more you look like Him, reflecting His image! A few weeks ago I received a phone call. It was from out of state, but I am used to that, since I minister all over the place. What was interesting was what transpired. I answered as I normally do while I am multi-tasking and working at other things at the same time. I said, “No. This is Edie. Can I help you?” By now, I thought he was a Craigslist bunny-buyer, or maybe he wanted some chickens. They always get my name wrong. He said he was looking for Eddie, and was this (my phone number). I said, “Yes, but there is no Eddie here.” Finding it humorous, I said, “But my name is Edie. It’s CLOSE!” I always try to find the humor, even when someone is obviously wasting my time. I said, “No. I’m sure.” He apologized and hung up. Two minutes later, the phone rang again. It was the same phone number. He laughed, I laughed, he explained himself again for a moment, as most “wrong numbers” do. We chatted again briefly and hung up. Meanwhile, my husband, who was in the kitchen near by, was listening to this conversation and was having fits. Darryl was motioning and telling me not to share information with him, he was probably a scammer, that is how they operate! “They say they dial a “wrong number” and meanwhile they pump you for information to scam you. That is exactly what they did to my relative….” He went on to tell me the story, complete with all of its details, indicting this presumed scammer to be the villain that he obviously was. So, fearing I actually had done our family ill, I looked this caller up online at that number in that city. There were no reports of scams from that number, the phone number was from the area he said he was from and it was a landline – incredibly, I didn’t think people used those anymore – and he seemed totally safe to me. Darryl said, even so, you shouldn’t be giving out your personal information to people over the phone. You never know. So, having been duly warned, and thoroughly chastised, I agreed to not give out personal information over the phone to any more strange callers that say they have a “wrong number”. Suddenly, I remembered what I had told Darryl! I had promised not to give out personal information anymore to strangers that called from a “wrong number”! Oh my gosh, what was I going to do? It was the same man! Convinced now that he truly WAS a scammer (obviously, why would he call back a second time! ), I zipped my lips. Not only was I NOT giving out personal information, He couldn’t even see me nodding my head! I recognized him, caught him in the act, and was getting him off my phone, as quickly as possible…but as nicely as possible, in the quote-end-quote, “Christian Way”. You have seen in the Christian end-times movies how one person makes half of the sign of the fish symbol, and another Christian comes along and makes the other half? You know, the “secret code” of the Christian in the end-times? We’re not really allowed to say that we’re Christians, but we somehow still have to let each other KNOW that we’re Christians? I paused for a moment, and thought. Well, now, that’s a horse of a different color, isn’t it? He’s a Christian. I am a Christian. Surely we can talk, now, right? He continued to tell me a little bit about what they did “up there” at their encampment in the mountains. It sounded so intriguing! Darryl and I had tried to make our way up to the mountains this summer, but got caught up in the demands of jobs and ministries, farms and books and obligations. But truly, that was all it took, one statement from one of the brethren to another, making the sign of the fish. We were off, chatting away, asking questions and filling each other in on the gaps. Two relatives that were talking to each other for the first time ever at a family reunion! Once I informed him that Darryl and I are Kingdom Promoters Ministry we were deep into conversation. He asked me a question about writing books and told me that he had booklets he wanted to get into print. I talked to him about my husband being the Artistic Director of the Woodlands Symphony, and don’t you know, he lives in the Woodlands half the year? He knows people that my husband plays with in his band. His entire staff are pastors and Christians. He has an annual music festival on the grounds of his camp up in the mountains. I talked to him about my experience of having lived in the mountains outside Denver for twelve years. It was a glorious connection, and a reconnection in the spirit realm. We ended the call with me sending his admin some information about our free Author Seminar. He said he might not see it for six weeks, as they have zero-connectivity up there, and didn’t want any! He said he would be by to meet us in person, soon. God had this gentleman call us at this “wrong number” TWICE to make sure we got connected. I refuse to ignore it. Here is a, “BUT GOD” Selah moment. ONLY God could connect two people, many states apart, using a “wrong number” as a ruse, with both parties standing to gain something from the connection. A true “GOD CONNECTION” as I define it is a “WIN-WIN-WIN” – You Win, I Win, and God Wins!!! Fortunately, it wasn’t necessary. Jesus made a way. FREE Author Seminar tomorrow morning, Tuesday August 16th at 9AM to 12noon. Learn how to WRITE, PUBLISH and SELL your book — FREE! You even receive a FREE workbook! Textbook available for only $10. Come on out to Pinnacle Apartments clubhouse, 10451 Huffmeister Rd, Houston, TX 77065. Visit www.KingdomPromoters.org/writerclass.html for more info! May grace (spiritual blessing) and peace be given you in increasing abundance [that spiritual peace to be [a]realized in and through Christ, [b]freedom from fears, agitating passions, and moral conflicts]. Get Ready for the Ants! We have recently been under attack – by ants. Armies of them, seemingly without number and without end have found their way into my kitchen. In Texas in summer, there is a lot of heat so outside it gets very dry and the ants are thirsty. Sometimes they come inside for water and if they find some food, they call all their little buddies to come and join the party. Usually when you see one, you see many more. Once a food source is found, they somehow contact their fellow ants. Silently they organize and follow a little scent trail to move back and forth, an assembly line of epic proportions, carrying food and water back to the colony. That is what happened in my kitchen. The ants found a food source and soon my kitchen counter was overrun with ants. There were so many of them! Even though I hit them with window cleaner over and over (I had no insect spray and it was the most organic thing I could find under my sink!) they still kept coming. They would not be denied. My husband called the exterminator, who came two days later to spray and set out traps. We have had a couple of minor bouts with them in the days following, but nothing like this first invasion! This speaks to me! I agree with Jennifer Eivaz that as prophets we live prophetic lives, and that God makes everything happen in my life for a reason — to speak to me so I can speak to others! The Bible says, “Go to the ant…consider her ways… (Prov. 6:6)”. Have you ever stopped to do it? I hadn’t, although I have heard this saying hundreds of times. This pushed me to do it, and knowing God was speaking, I began to meditate on ants and their habits. The first thing I thought of was how industrious ants truly are! They store up provision and never rest. Next, I realized they are also totally annoying! I looked up the symbol of the ant in my dream interpretation resources and it had both a positive connotation and a negative connotation. I found both to be true! Because of this, I believe God was speaking to me through these little six-legged wonders. First, on the negative side — who really LIKES ants??? An entymologist, perhaps, but for most of us, they just don’t float our boats. Although as children we may have had ant farms, we don’t house them intentionally as pets. For most of us they are simply an annoyance and a pest. As for me and my house, they don’t belong in my kitchen! Even though I had sprayed the ants with window cleaner, as I was mopping them up with paper towels some were still alive and crawled up my arms and hands – yuk! Their touch on my flesh made my skin feel creepy, and still does when I stop and think about it. In fact, I apologize to you if your brain is telling you that you feel something crawling on you now, too! On the positive side, they have many admirable traits. They carry up to 50-times their own body weight; they are selfless and have only the community good in mind; they never stop working, they care for their young as top priority in the mound and put them before themselves. They are models of hard, focused, diligent work. 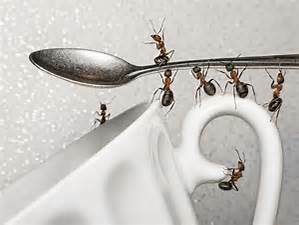 They know their assignment on behalf of the colony and do ONLY that job – a worker ant doesn’t try to be the queen! They live out of sight underground until they come out for the community good, to forage for food, water or to protect the mound. Listen, church – I believe God is speaking to us. We need to practice what the Word says, and GO to the ant! The Hebrew word for GO here is halak. This word has a number of different uses throughout the Old Testament, among them “go”, “walk” and “come”. However, in studying this tiny little word with the giant meaning, I found it also means “act”, “become” and “becoming increasingly”, as well as “grew steadily”, “grew continually”, “lead”, “march” and a plethora of other meanings. All contained in this little two-letter word, GO! This shone a whole new light on this passage of scripture! This means the author of Proverbs 6:6 may have meant for us to, “act like the ant…” or perhaps to “become as the ant (is)…” The author may even have meant for us to “become increasingly like the ant…” or “grow continually (to become) as the ant…”, to “lead as the ant (leads)…”, “march as the ant (marches unceasingly)…” or any one of these dozens of different uses for this word. Hmmm. Food for thought, no? Well, here is where I believe this tiny little proverb fits into a great big prophecy. Remember the “whodunnit” movie based on the game CLUE? It had multiple endings, so we would go to see the movie with ending A, then go back to see it with ending B. Incredibly, when God first started to talk to me about the ants, He spoke to me on two different levels, two different paths, two totally different thought processes about what the ants truly meant….two different endings or interpretations of the same saga! The ants are negative thoughts, based on political, economic and cultural circumstances and what the media is feeding us. These negative thoughts and feelings have marched on us, an army, a home invasion of sorts into our respective houses, and they will not be denied! Uninvited, they storm our fortresses by the scores because they have found a “food source” in our hearts and in our minds — our fertile imaginations and attitudes! With no barrier to keep them out these negative thoughts and emotions travel at will, unhindered and set up shop. What’s worse is they call their other friends, even more negative than them, to come and join the feast! We have no natural protection against these thoughts! I heard recently that the human mind defaults to the negative. We have to consciously WORK to stay positive! That is why the scripture reads in Philippians 4:8, “Finally, brothers, whatever is true, whatever is honorable, whatever is just, whatever is pure, whatever is lovely, whatever is commendable, if there is any excellence, if there is anything worthy of praise, think about these things.” This means do not repeat negative things! Watch what comes into your eye gates and ear gates and what comes out your mouth gate! Because what comes in MUST go out. Proverbs 4:23 says, “Above all else, guard thy heart; for out of it flows the issues of life.” Why? Because, “Out of the fullness of heart the mouth speaks (Luke 6:45).” What you speak, you hear; and what you hear, you believe! This just perpetuates what the enemy is trying to do in our lives – make us say and stay negative! BUT GOD! He is the TERMINATOR, and He even says, “I’ll be back!” Just as my husband had to call the bug guy to take care of our invading army of ants, so we are to call in our ultimate BUT GOD exterminator, Jesus – “The Terminator” – to take care of the invasion of these negative thoughts! He will come in and spray them down with Holy Ghost, wipe them up with His mighty right hand and set out the traps to kill off the remainder of the colony of negativity. As a final note, precautionary measures were required to keep the ants from coming back. We had to make sure everything stayed clean and we didn’t leave any food sources out to attract them back. In the same way, we MUST use our spiritual weapons, “…for the weapons of our warfare are not carnal, but mighty through God to the pulling down of strong holds…” (2 Cor. 10:4 KJV). We must use our FAITH, our JOY and our PEACE as offensive weapons and put into practice what the Bible says to do! We must actually use the wisdom that He has given us in His word – speak positive, think positive, be positive. No stinking thinking! That just attracts them. Realize that you are not perfect, and we do not live in a perfect world! I have had a couple more bouts with these ants in my kitchen, the heart of my home, albeit in smaller numbers. I also continue to have bouts of negative thoughts in my heart, although they are less frequent and less intense than they have been in the past. Just understand this might happen to you, too! Don’t be too hard on you. Cut yourself some slack and give yourself grace. None of us have arrived yet! Just let God be God, and in this way not only will we be able to wipe out any negative thoughts and thought patterns that we have developed, but we can keep them from coming back and bothering us again! The second scenario of this invasion of ants is a lot more exciting. God spoke and told me that in this scenario, the ants are the next generation of worshipers that are heading in droves to the church, into the arms and the heart of God. They are seeking and searching, and they will find! God says whoever seeks shall find and whoever asks will receive. Whoever knocks, the door will be opened to him! This next generation will catch wind of the food, the fresh manna, the new wine, and they will come, and they will come, and they will come without end…and they will not be denied! They are hungry, past famished to the point of starvation. They want something but don’t know what, and they have sent out their “scouts” into the different arenas…new age, the occult, satanism. They have searched long and hard, and at long last, they have found — Jesus! Now they will come, a mighty invasion unlike anything else we have ever seen before! There will be countless numbers of them, armies without end. There will be so many of them they will be crawling all over us, all over the hands and the arms of Him that loves them. And some of them will make our flesh feel “creepy”… however, that is when our BUT GOD exterminator will show up! He will exterminate all our religious spirits and wipe us clean until there is nothing left but unity, compassion and love. I believe just like the positive characteristics of the ant so will be this group that comprises the end-times church, unseen since the second chapter of Acts. They will carry more than their own weight, be selfless and community minded; tireless, care for their young as a top priority; they will be diligent workers; they will be focused and do their job with no hidden agendas. They will be humble and live only to promote their Lord and Savior, King Jesus! This group will be the ones to see His face in the earth as he returns to catch His bride into the clouds. So shall the church again be, in the Name of Jesus! Arise, end times church! Arise and March! Author Edie BayerPosted on August 2, 2016 August 2, 2016 Categories UncategorizedLeave a comment on Get Ready for the Ants!